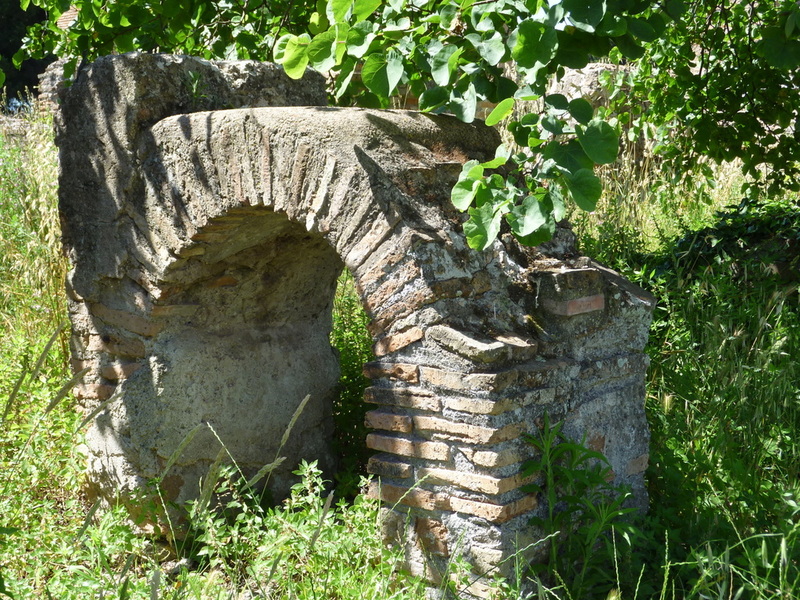 Ostia Antica, Photo by NIcholas DiStefano. Friends Nick and Wally were here for 5 days after their 2+ weeks in Sicilia. 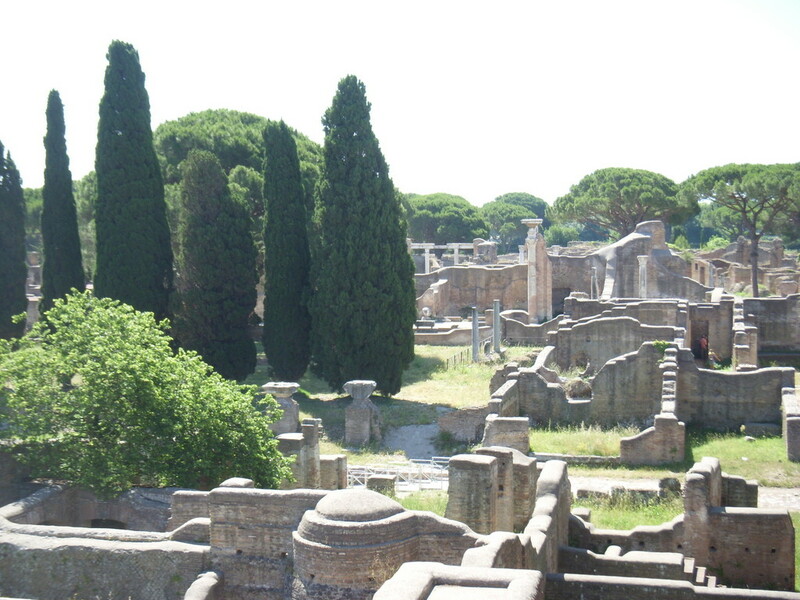 Pompeii was initially high on their list, but they decided to try the Ostia Antica experience instead of the lllooonnngggg day trip to Pompeii from Roma. We were game to accompany them as Ostia is on our list. Field trip: I was lucky to catch part of the teacher’s lecture. Luckier still to have understood most of it! Perhaps my Italian comprehension level approaches 3rd grade. To avoid the afternoon heat we started out at 08:15 Sunday morning. Bus to Termini, metro to Porta San Paolo, and then a train to Ostia, put us at the gate to OA about 09:30. We almost had the place to ourselves! There was a German group of college-age kids, a couple of other groups that seems to be archeology students, and what appeared to be an Italian grade school group on a field trip.Ric and I loved Pompeii when we visited there last December, but this is such a different experience. 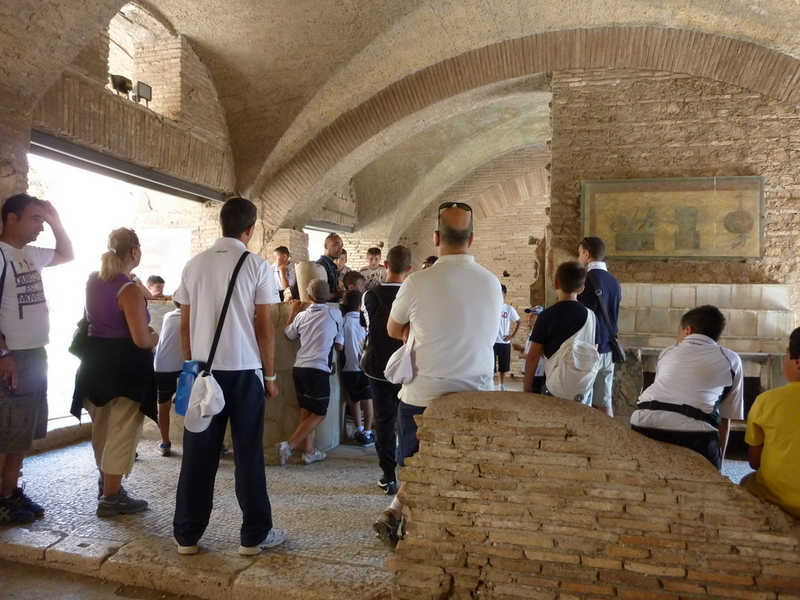 Ostia is an easy self-guided tour, with Rick Steves’ narrative to keep us on track. It is a very peaceful site where one can wander at will. The wildflowers bloom throughout the site, softening the edges of the ruins. 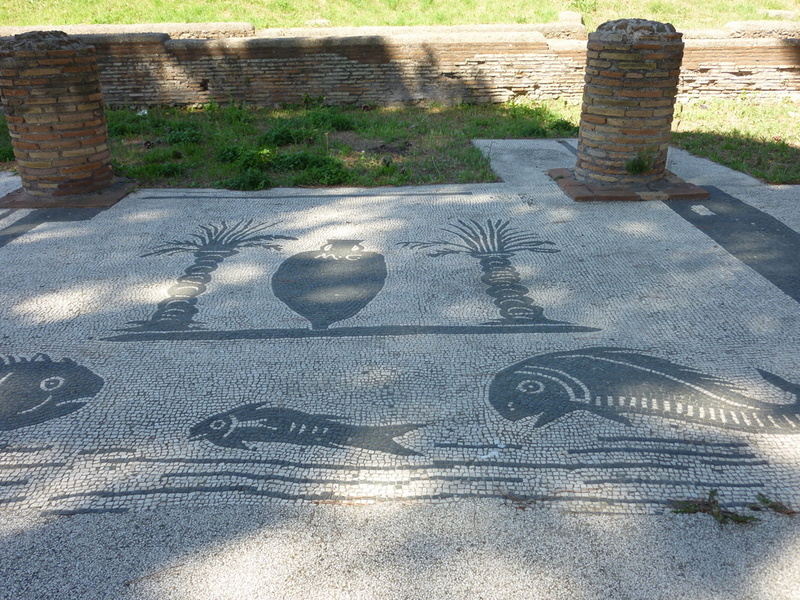 There are amazing intact mosaics depicting the merchants and baths of Ostia. It seems like nature could easily take over the site and it would be lost to us forever. 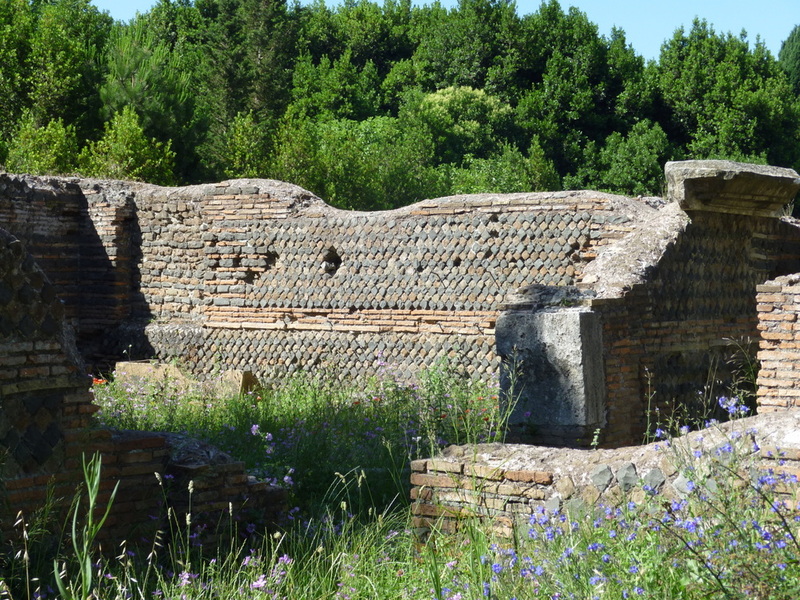 Ostia has a long history, having been founded in 620 B.C. (!!! ), but as the Roman Empire declined, Ostia became less important. There were invasions and pirate sackings, and eventually due to floods the Tiber River shifted and land-locked Ostia. 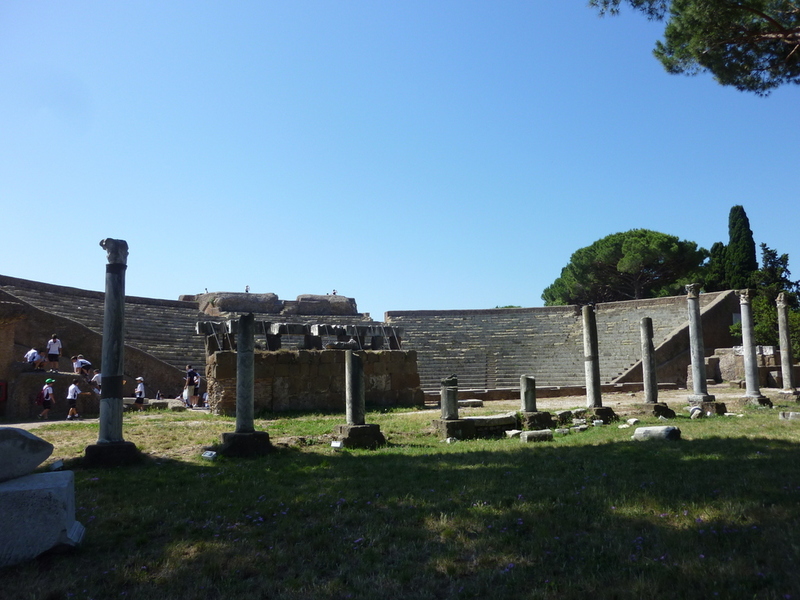 What the volcano did to Pompeii, politics, flooding and time did to Ostia.Ostia gives wonderful insight to Roman town planning, life and construction. You can arrive from Roma on a simple metro/bus ticket for €1.50 each way. It’s a half-day trip, perfect for a summer morning. We were home for lunch by 13:30. Entry is €8.50 per person (although residents over 65 with a codice fiscale get in for free). I won’t drag the narrative on and on. Here are some additional pictures to tell the story. In the “Piazzale delle Corporazioni” or Square of the Guilds. mosaics depict services and products in a universal language. Ostia’s Theatre: Still the site of entertainment, but leaning toward concerts in the current era. Laurel, Thanks for your wonderful post. I felt like I was on the trip with you. Miss you and love you both. Certainly looks like a nice way to spend the day! Hot hot hot here! Lucky we got out in the AM! I am loving traveling though Italy through your blogs. Thanks for taking the time to include us in your life. You’ll need to come over and enjoy Italy in person, Diana! What a delightful day trip for you. And, your narrative and pictures are superb. If you ever get tired of your day job, I know you can become an author. You keep up all this interesting history, you are liable to find me on your door step wanting more!!! What do you suppose in our country people will find after so many years? Mt Rushmore maybe? Grand Canyon? Come on over Carolyn! We’ll show you around!